In a small saucepan bring the broth and carrots to a boil. Turn off the heat and add in the couscous, stirring. Cover tightly and let sit for 10 minutes. 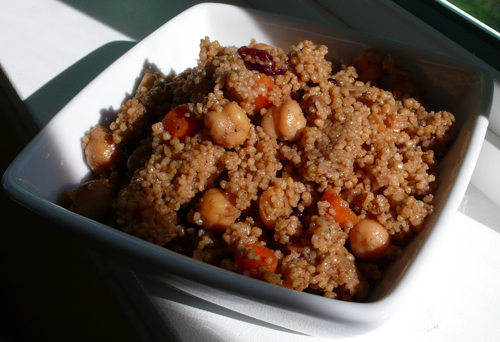 Add the couscous to a large mixing bowl and toss with the garbanzo beans, pecans and cranberries. Whisk the dressing together and drizzle over, then stir in well. Chill for a couple of hours to meld the flavors.